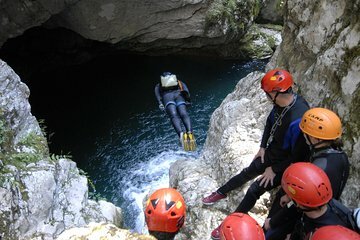 Seja ativo em Montenegro com esta viagem cheia de ação para o exuberante Parque Nacional Durmitor por meio dia de canyoning no Nevidio Canyon. Coma um pequeno-almoço e almoço e experimente a beleza que é esta parte do Montenegro. This was our firsy time ever doing canyoning, and it was more than great! The guides of Nevidio Canyoning are the best, very helpen and very friendly. We could do a lot of jumps, the adrenaline level is quite high at home times... Really amazing! This tour was an amazing highlight in Montenegro. The hosts were super kind, food tasted really good and in the tour itself it was a right mixture of pure adrenalin, being in touch with nature, swimming, jumping, having fun. Absolute recommandation if you are willing to have some action, they even have a Facebook site where videos and pictures of all tours can be seen!